This post is intended as part of the Criterion Blog-a-thon, hosted by Kristina at Speakeasy, Ruth at Silver Screening, and Aaron at Criterion Blues. Click HERE for the full roster for the event! It’s been a good couple weeks for me and the Criterion Collection. They had a 50% off flash sale in early October and then they did their annual November sale with Barnes & Noble, and I proceeded to clean up about half of my profile wishlist. I’ve enjoyed coming home to a brick of Blu-Ray, whether the single-chaptered crisp blue key of Mulholland Drive, or the much-anticipated update of the classic Fisher King Criterion laserdisc. And then, today on the Criterion blog, I learned that the Speakeasy and Criterion Blues film blogs had organized a marathon of homage posts to the collection. Today featured English-language films from 1947 until 1980… which should have included Charade, but no one seems to have stepped up and claimed the title. I don’t really have the time to spend on this, as I should be working on other writing, but I shall stride in where others haven’t deigned to tread and add my own small, unrequested contribution. I have previously written on the fiftieth anniversary of the film, of copyright issues surrounding it’s public domain status, and how I first started buying various editions of the DVD way back in 2002. The film has either been a touchstone or an obsession of mine, depending upon who you talk to. So what remains as a topic to address? A day after the internet, particularly “Film Twitter”, went nuts about the idea of remaking Memento, it could be time to mention that The A.V. Club listed Charade first amongst its list of films that merited updating or at least a revisit. Cameron Scheetz acknowledges that Jonathan Demme already tried this, but still seems to think that the chemistry and repartee between the leads would crackle under the deft hand of someone like Steven Soderbergh, saying the script would foster his “ability to build palpable, simmering chemistry between his two leads amid a thrilling crime yarn.” I adore Soderbergh, and have faith in his timing, his stylishness, and his control of tone. And if there’s something that Charade tries very hard to do, it’s to pendulum between these three cardinal points of romance, comedy, and genuine suspense, occasionally dangling one over the dark pit of whether a classic Hollywood star could actually be sharkskin: deliciously smooth in one direction, but barbed and even savage in the other. And in Soderbergh’s Side Effects, we unfortunately saw that he wasn’t able to successfully manage that kind of audience deception. That the consequence of lying to another character also meant completely obfuscating the audience as well, which rendered revelations and payoff as a disappointing gruel. Stylish and engaging, but with a sense that not even the most dedicated of mystery readers could have found the hidden clues and followed along at home. But no, let’s not talk about what the film shouldn’t be, lets talk about how the film succeeds, and then wrap up by noting what the disc itself provides. The film offers up a strange insouciance, an unflagging belief that the charm and profile of its leads can overcome any obstacle, including the age difference between them or the fact that Reggie would have to be a fool to let their chemistry blind her to a whole honor guard of red flags. When Regina “Reggie” Lampert first meets Cary Grant’s Peter Joshua poolside at a ski resort, she has just told her best friend that she’s not willing to engage in an affair before she divorces her husband. And yet she’s already flirting outrageously with a man she just met and asking him to call her when they both get back to Paris. We don’t feel their chemistry immediately, not beyond their marquee status as of yet, and Reggie’s actions are hard to fathom: when she looks at her husband’s dead body in the morgue, and states “I’m very cold”, is she referring to the ambient surroundings or her own detachment from the circumstances? When her eyes pop at discovering that her late husband had four passports and was a former agent for the wartime Office of Strategic Services, do we believe this? Especially after her complaints to Sylvie that she suspects her husband kept secrets from her, and her answers to the police judiciaire demonstrate that she knew almost no personal details about the man to which she was married. Complètement absurd, ou non, her predominant emotion is one of hunger, more than fear, doubt, or amazement. And it’s this running gag to stress-based consumption that first gets us to thaw towards Reggie’s distance and cavalier attitude toward her circumstances. Intentional or not, her chain consumption of barely smoked cigarettes, her relentless appetite for sunflower seeds, ice cream, and a constant series of meals mirrors the popcorn consumption of an equally voyeuristic audience, gobbling the circumstances down with their eyes. And despite repeated warnings that we shouldn’t trust Peter Joshua — or is that Alex Dyle? Or yet Adam Canfield? — the film bends over backwards to tell us that we must. In a scene that works against all odds, Reggie and Peter are vainly trying to pass an orange between their chins, sans servir de leurs mains, and as they twist and press against each other and the spectators laugh, they look into each other’s eyes, and the soundtrack fades away as if muffled by cotton wool. And by this we are told that this is real. That games and lies and false identities and prowling ex-soldiers may close in around them, but this, this we can trust in and root for. And the banter redoubles, with every player claiming that circumstances are deadly serious, and yet revealing a conversational style that cannot help but comment wryly on the circumstances. Tex Panthollow muses wistfully on the heavenly possibilities of counteracting dismemberment. Inspector Grandpierre almost can’t believe a claim that two attractive people in Paris aren’t sleeping with each other — in Paris, of all places! — and must therefore accept it as an alibi. Neither Hepburn nor Matthau can complete an anecdote without getting distracted by the fact that they’re actually, really filming in Paris in front of local color, like the morning market at Les Halles or the Cathédrale Notre Dame. So while <spoilers!>Walter Matthau’s villain monologuing may be some of the least convincing ever put to film, and a stage made up entirely of trap doors may not be a feasible feat of engineering, we coast along on the glinting smiles and the gleaming eyes of pretty people delivering pretty dialogue, and a soundtrack that tells us when to be caught up in romantic swells or temporary tension. The disc makes fine work of the Maurice Binder title sequence as its primary design element for the menus and box art. A trademark “Director Approved” disc, the Criterion Charade has one key feature amongst a few text-based extras and a trailer: an excellent and informative commentary track, with it’s own chapter titles for helpful navigation. Donen and Stone are fond of their classic film, a little hazy and occasionally contradictory on details, but with a firm grasp of other minor points. As a collection and recollection of trivia, the track strikes the exact right note of listening to the reminiscences of a fond, bygone era by those who haven’t quite left it behind yet. Grant and Hepburn had died before the film was released in its first Criterion edition in 1999 in letterbox format, and Matthau, Coburn, and Stone had followed before the film was reissued in anamorphic widescreen in 2004. Donen leads a small handful of participants still remaining with us. It’s not a vastly celebrated title. It regularly shows up on lists of “Hitchcock-esque” films, and Tumblr and Pinterest cultivate the cult of fashion that Hepburn exemplified during her collaboration with Givenchy. So it’s not forgotten, but it’s not a list-topper, and the fact that it was left out of the blogathon isn’t particularly surprising. But it shines. Compare it to Donen’s own follow-up to the romantic espionage genre, Arabesque, or to the twisty contemporary Gregory Peck vehicle that followed Charade a scant year later, and which also featured both Matthau and Kennedy, the similarly-titled Mirage. Those films are well-constructed and intentioned and yet are largely forgotten by any but the most devoted enthusiasts. 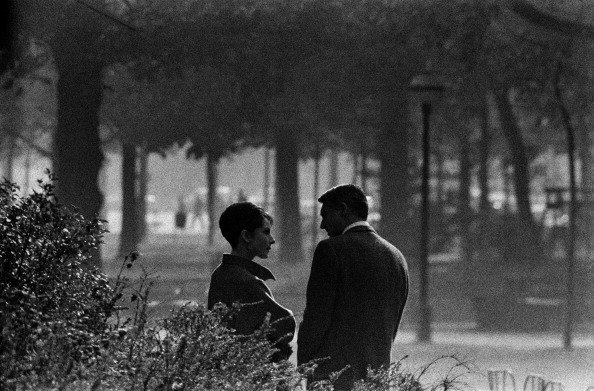 Charade is a nexus of talent and charisma, and while Donen would almost never be prominently listed in catalogies of filmmakers favored by those who support auteur theory, the fact that (as far as I understand — and I’ve been publicly wrong about this stuff before) he independently produced the film for Universal to distribute feels like an early blow for indy cinema, and a model for filmmaking that would dominate creative conversation for years to come. I close with perhaps the best animated gif of all time. Thank you. Ha ha! That is the best animated gif of all time! That aside, I agree with your review. It’s been a few years since I’ve seen Charade, and I realized I miss it! Will be digging it out of my collection this weekend. 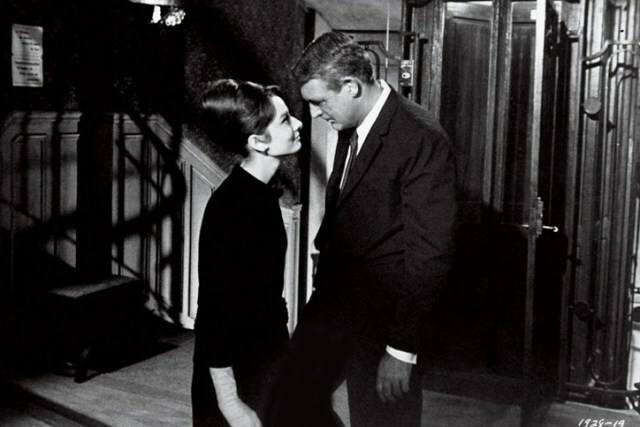 My fave line from the movie is when Audrey Hepburn asks Cary Grant if he knows what’s wrong with him. When he replies, “What?” She says, “Nothing.” So charming.